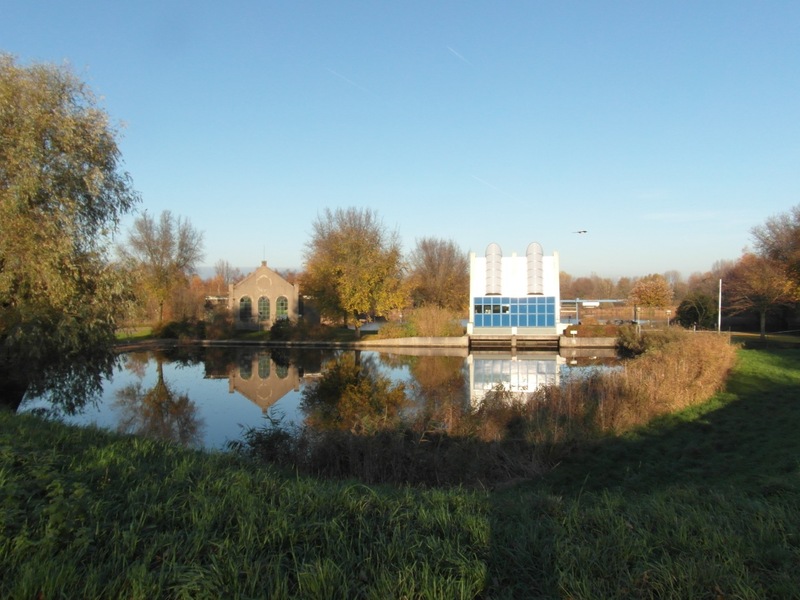 This route passes the northern docklands, through a rural linear village, to the new suburbs and the historic core of Purmerend, returning through a reclaimed lake-bed polder, and along a 19th-century ship canal. 41 km, about 4 hours. Revised February 2019.
start at the main ferry landing behind Centraal Station (Route 9 also starts here). Cross by the NDSM ferry – less frequent than the other ferries. It departs every 15 minutes (30 minutes off-peak). The ferry crosses the IJ estuary, which was originally wider. Land has been reclaimed on both sides: Centraal Station was built in 1889 on an artificial island, cutting the city off from the estuary. On the north side, the former Shell complex has been redeveloped, and the adjoining docklands are being cleared. On the south side you pass the 1889 grain silo “Korthals Altes” converted to apartments, the Silodam apartment block, and the large new Pontsteiger apartment building. the ferry arrives on the north shore (in Amsterdam-Noord), at a classic former dockland landscape with maritime curiosities. The docklands are on former estuary floor, reclaimed around 1875 – the original sea dike is further back from the river. The land was reclaimed for agriculture, but it was ideal for the industrial expansion after 1890. A strip of dockyards, factories and chemical works developed, cutting off the later housing from the IJ. turn right as you leave the ferry, and then cycle away from the ferry: follow the green/blue ‘UIT’ sign. pass the shipyard halls of the NDSM, the Netherlands Dry-Dock and Shipbuilding Company. Shipbuilding here ended in 1984. The halls are now an art/media/event centre, a classic ‘regeneration’ strategy. Ultimately, the entire northern waterfront (as far as Zaandam) will be redeveloped. The ferry route itself, begun in 2004, was intended to accelerate development, and it did. when you reach the main road (Klaprozen weg, no sign here), first cross the road, and then turn right along the cycle path. pass an elliptical metal building (sewage pumps), and then turn left onto a very short cycle path, followed by a road. Don’t cross the bridge on the main road. pass yellow apartment blocks, then keep to the right, on a new cycle path. Pass on your right houseboats, on your left new housing (under construction). when the path rises slightly, turn right across the new cycle bridge, crossing a canal lined with houseboats. This is Zijkanaal I or Side Channel I – when the land was reclaimed, these ‘side channels’ were left open, to connect existing drainage sluices to the estuary. on the other side, turn left. You are now on the former northern sea dike of the IJ estuary. To the right is land that was ‘reclaimed’ in the Middle Ages: strictly speaking it was enclosed by dikes, it was not seabed. To the left was a tidal estuary, until the 1870’s reclamation. further along the dike road, there is a pumping station on the right, Gemaal Kadoelen. Two, in fact: one 19th century, and its 1987 replacement. Water from the pumping station is drained to the estuary via Zijkanaal I. As you pass the old pumping station, there is a green-painted cast-iron pillar on the left side of the road (obscured by foliage in summer). It carries the number 46, and the text “Noorder IJ- en Zeedijk”. These pillars are old dike kilometre markers, which extend to km 71 at Beverwijk. continue along the dike, passing a construction site. After nr. 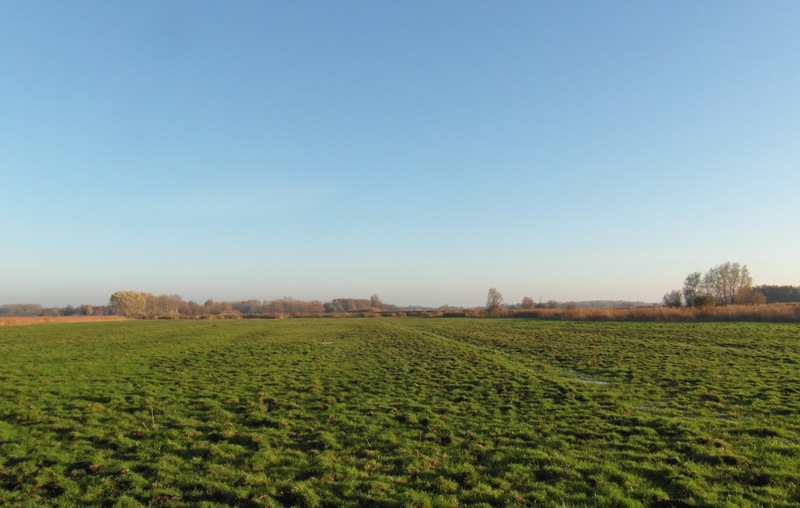 145, stop to look at the Wilmkebreek polder – an intact open polder, inside the city. 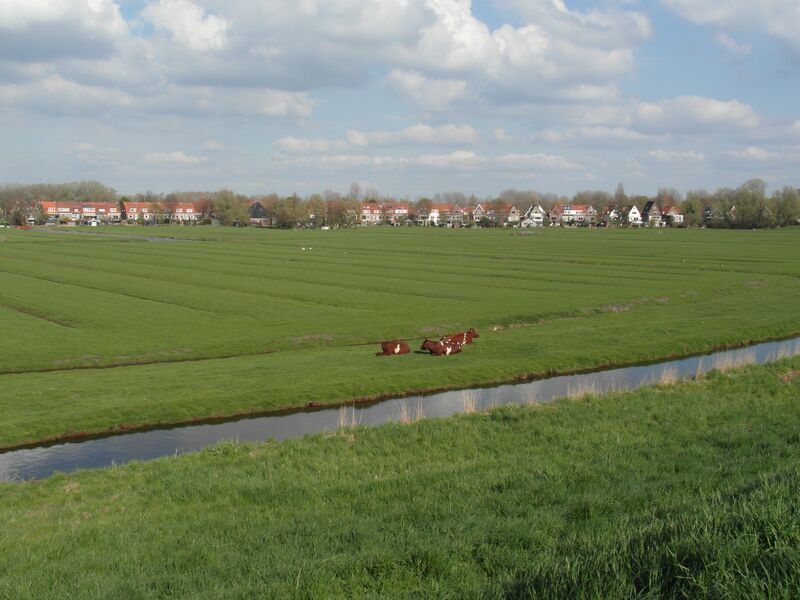 It is unusual that such a polder survived: it is still used for grazing, but is now threatened with development. Looking down here, you can see the typical structure of polder drainage systems. The road is on the original sea dike: the water to the left is separated from the sea only by the locks at IJmuiden. Below the road is the small ring canal of the polder, and inside it is a third water level (about 4 metres below mean sea level). Multiple water levels, drained upwards against gravity, are characteristic of the Netherlands polder landscape. The ending ‘-breek’ in the polder name, indicates a breach in the seadike, at some time in the past. The water rushing in always scours (deepens) an area behind the breach. After the dike is repaired, a small lake is left behind. In this case, it was large enough to be reclaimed separately. after the polder, there are houses on both sides of the road. The stepped alleys between the houses are typical of dike settlements. The name of the dike road changes, from Landsmeerder dijk, to Oostzaner dijk. at Oostzaner dijk nr. 29, turn right, following the sign for Oostzaan. (It is easy to miss this sign). Cross the bridge over the small canal, into Zuideinde. The housing is now different, this is the beginning of Oostzaan, a linear settlement in the older polder landscape (Waterland) north of the IJ estuary. The village extends north-west from the former sea dike, a long street of older rural housing with some farmsteads. Between them is later suburban infill, untypical for Amsterdam: detached and semi-detached houses, with gardens front and rear. The suburban character developed at the time of the First World War, when workers commuted to the docks and industry of Amsterdam-Noord. Even in the 1880’s, there were regular steamboat services to central Amsterdam. By the 1960’s Oostzaan was effectively a residential suburb, and the southern end was annexed to Amsterdam. There is a ‘twin’ settlement, Westzaan, on the other side of the Zaan river, with an identical linear structure, also aligned parallel to the Zaan. In both cases the structure was determined by the mediaeval reclamation of the peat bogs. 1 km further, pass under the viaduct of the ring motorway. It forms the boundary of Amsterdam, and you enter the residual Oostzaan municipality, with 9700 inhabitants. continue along Zuideinde (‘south end’). Go straight on at the traffic lights, on past Presto Cycle Sport. There are housing estates on both sides of the the old village street. pass at nr 33 the former Polderhuis, administrative offices for the water infrastructure (dikes, canals). Just after it, cross a bridge over a small channel. These channels, at right angles to the village street, are typical of the linear polder settlements. Too small to be called ‘canals’, they were nevertheless used for agricultural transport. Farmers went by boat to milk the cows and cut the hay, and the produce went to Amsterdam by boat. The main street itself was originally a canal, with houses on both sides. (More of this landscape later). continue to the village church, in the old village centre of Oostzaan. continue straight on: after the village core, the houses thin out. Across the fields on the left, you can see the slab blocks of Zaandam. On the right, the trees are in Het Twiske, a 1970’s recreational park laid out in a polder. Reclamation of Het Twiske begun in the 1930’s, as unemployment relief, but the Netherlands no longer needs to reclaim farmland. Parks have a higher priority. at nr 121 the road forks: turn right into De Haal (no sign here). The fork left, De Heul, is a dead end. These are settlement names rather than street names, and here the original village structure is best preserved. (De Haal was also a dead-end road, until 1884). On the left further on, there is a ditch alongside the road, and simple wooden bridges at each farm. pass (opposite nr 58) Stations straat, the access road for the former station of Oostzaan, on the 1884 line from Zaandam to Hoorn. continue straight on (cycle sign for Purmerend). Between the houses, the landscape type is now clearly visible – grassland, high water table, broad ditches, island fields. Settlement here began late, by west European standards – until the year 1000 this was uninhabited peat bog with tidal creeks. At first the land was above sea level, but when peat is exposed to air by ploughing, it oxidises and shrinks. By 1300 the land was too wet to grow grain. To raise the fields, soil was cut from the banks of the ditches and spread on the field. This widened the ditches, eventually producing the landscape of island fields with grassland. It is called a vaarpolder, a boating polder, because all agricultural work was done with boats. Some of the fields are now overgrown with reeds. This is the so-called New Nature policy – the subsidised abandonment of farmland, to revert to a pseudo-natural state. With a huge surplus of farmland in the EU, the reclamation work of 1000 years can simply be abandoned. at the last house, the road bends right, and 400 m further, you cross a lifting bridge. The wider channel here is the river Twiske. 100 m after the bridge, turn left onto a cycle path: follow the cycle sign for Purmerend. cycle on through open landscape, parallel to the railway. The new housing of Purmerend is now visible ahead. at the next cycle sign, turn left across the rail line, again toward Purmerend. But don’t stop in the middle of the railway to admire the view. (The crossing has a half-barrier and warning lights). at a cluster of houses, turn left, following the cycle sign Doorgaand Verkeer (‘through traffic’). The reed-lined canal here is a polder ring canal. 100 m on, turn right across the canal, again follow the sign for Purmerend. You are now on the ring dike of a polder, De Wijde Wormer, a lake reclamation project of the 17th century. The correct name is not polder, but droogmakerij, ‘dry-makery’. 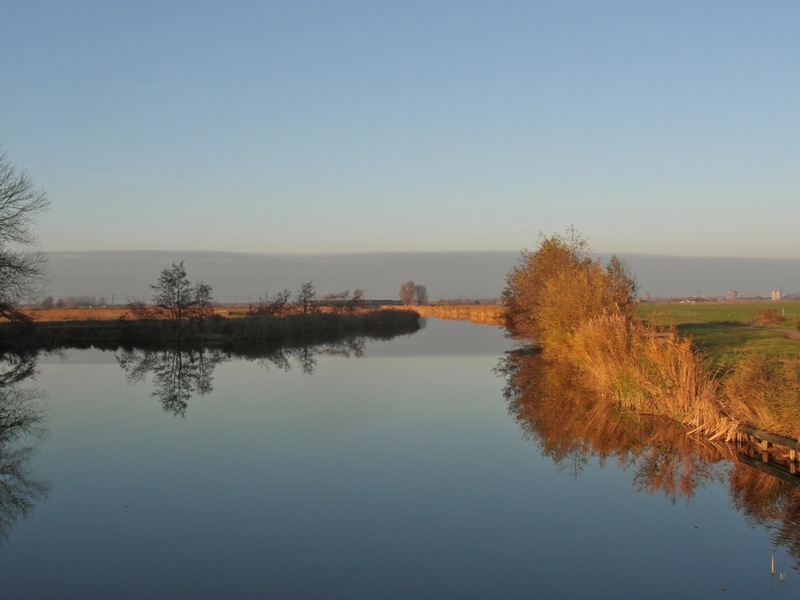 Unlike a polder, the land was permanently under water: it is about 4 metres below sea level. The merchants of Amsterdam invested in the reclamation of lakes to the north: Beemster (1612), Purmer (1622), Wormer (1626). Chains of windmills were used to drain lakes: the largest preserved example is at Kinderdijk outside Rotterdam, the only functioning chain is at Arlanderveen, near Alphen aan de Rijn. The Wijde Wormer originally had 12 drainage windmills, replaced by a steam pump in 1878. The agricultural landscape here is planned on straight lines, contrasting with the irregular mediaeval pattern outside it. The farms are all located on two tree-lined longitudinal roads, the central axis was the main drainage canal, but it was displaced for the Amsterdam – Friesland motorway. The farms are larger than those in the older villages, with newer and bigger cattle sheds. This is also grassland, but with large working farms, in the normal agricultural economy. It is not ‘producing nature’, but producing food. Until 1991 the polder was a separate municipality, with about 1 300 inhabitants – a relatively low population density of around 80/ km². cycle on along the dike, toward the new housing at Purmerend. From the dike three different water levels are visible: in the older land, in the deeper reclaimed lake bed, and in the ring canal (between double dikes). To the right is the village of Purmerland, another linear settlement, along the old road to Purmerend. at the power line, pass the first houses of Weidevenne, the newest expansion of Purmerend. 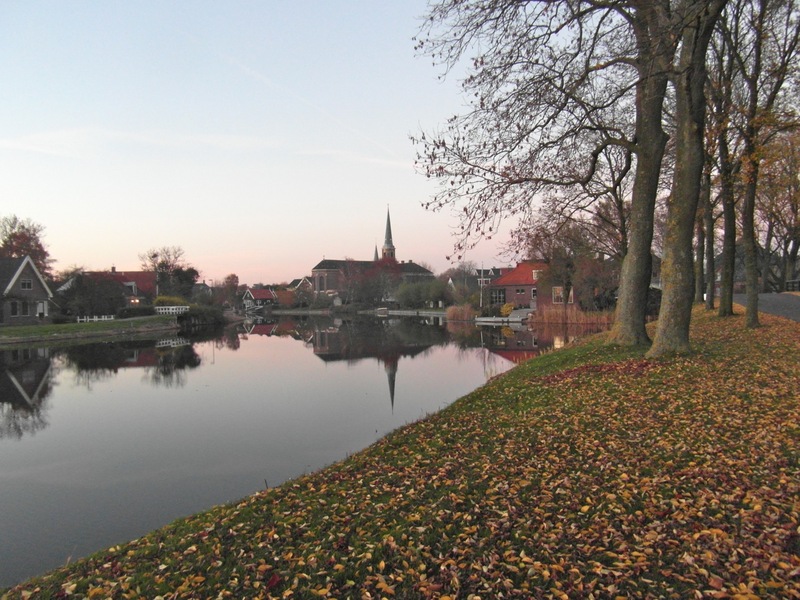 Weidevenne is a typical VINEX location. VINEX was the 1990’s answer to growing demand for housing, an abbreviation for the Fourth Policy Document on Spatial Planing Appendix (VIerde Nota ruimtelijke ordening EXtra). The idea was to “limit suburbanisation” by concentrating housing at the edge of existing cities. As you can see, a VINEX location is a suburb anyway. at the metal cable-stayed bridge, turn right across the ring canal. The wetland and the waterside houses are typical of new housing developments. go straight on along the cycle path, to the new Weidevenne station. Just before the station underpass, turn left, sign for Purmerend-Centrum. cycle past the coloured houses, and go on into the cycle underpass. After the underpass, the path bends: continue toward the tower block. continue on the main cycle path, through the newest part of Weidevenne. The path is an old road to the town centre, but there are no old houses. 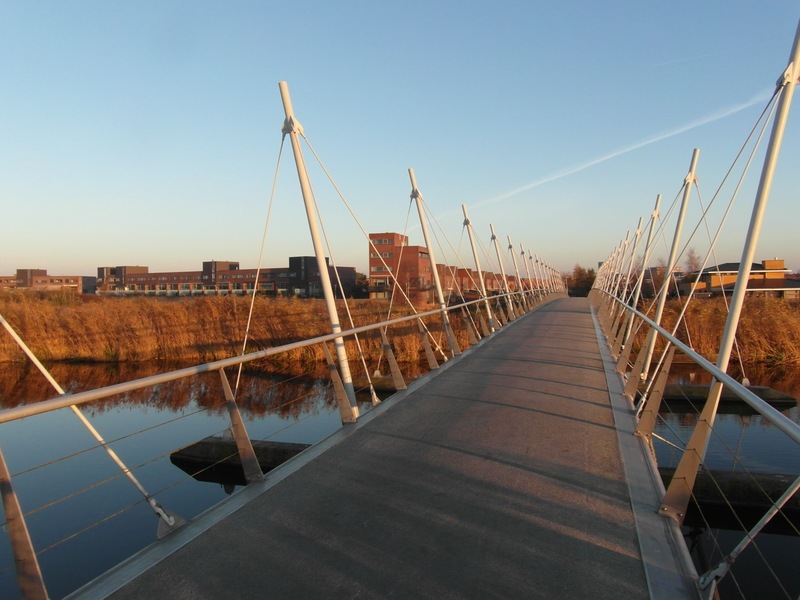 go straight on to the new cycle bridge, across the Noordhollands Kanaal (1824). The canal begins in Amsterdam: it was one of several attempts to by-pass the shallows in the former Zuyder Zee. Ships were drawn by teams of horses, on past Alkmaar, to Den Helder on the open North Sea coast. The North Sea Canal, cut straight through the dunes in 1876, finally guaranteed port access. 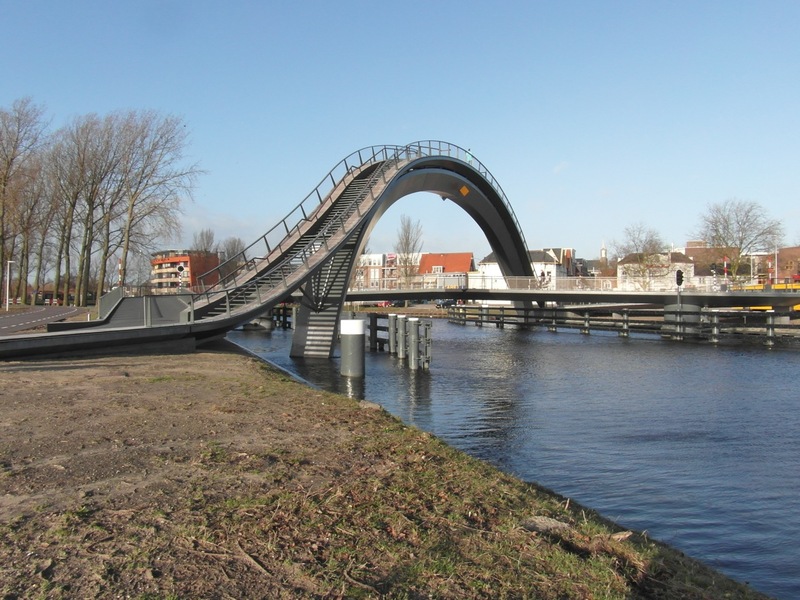 cross the zig-zag cycle bridge, then cross the road (Tramplein) into Gouw, an old street leading to the centre. Tramplein (Tram Square) takes its name from the old tram station here. The present bus station building is a replica of the former tram station. continue through Hoog straat: step off your bike here. 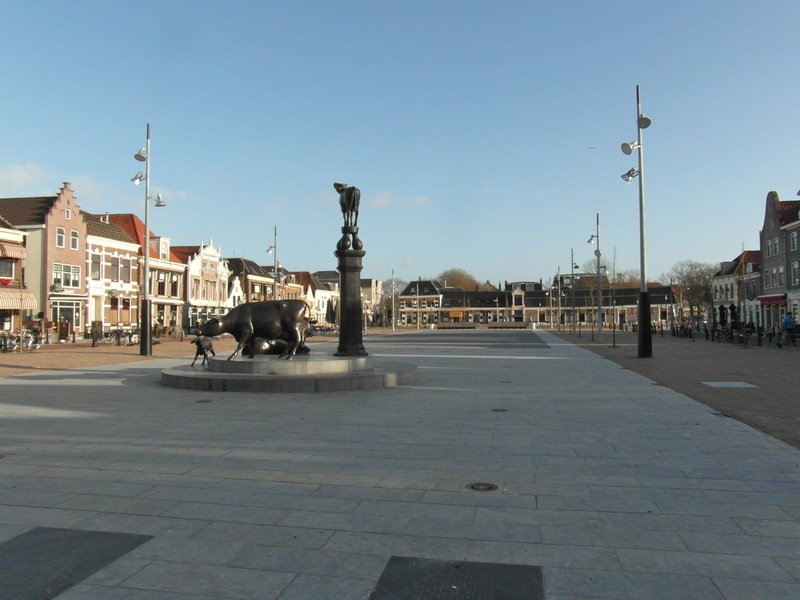 At the end you are in Kaasmarkt, the historic market square of Purmerend. In front of you is the former town hall, now the local museum. On a map, the historic core is tiny in comparison to the present city. 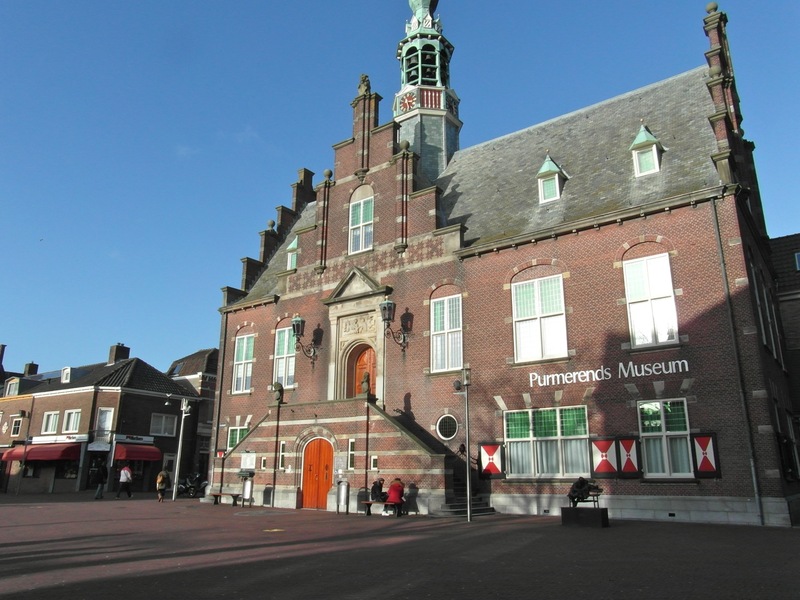 Purmerend was originally a fishing village, with three lakes around it. When the Beemster, Purmer and Wormer lakes were reclaimed, it became a market town for the surrounding area, a function it retained until the 1950’s. In 1884 it was linked to Amsterdam by railway, and from 1894 by steam tram along the bank of the Noordhollands Kanaal: there was also a steamboat service along the canal. In 1950 Purmerend still had only 7 000 inhabitants: planned suburban expansion began in 1957. In the 1970’s it was designated as an expanding town, ‘groeikern’. The expansion was intended for families from Amsterdam, living at low densities, with employment in the area, and some commuting to Amsterdam. Purmerend did provide that – but household size fell, work patterns changed, commuting distances increased, and consumer expectations of housing rose sharply. Weidevenne increased the population of Purmerend to 80 000, but residents work and shop in Haarlem, Zaandam, Schiphol, or Almere. Already, two-thirds of the working population works outside the municipality. In retrospect, the ‘satellite town’ concept was dependent on low car ownership, low employment dispersal, and standard family structures – the father as breadwinner in full-time employment, mother at home and children at school in the leafy suburb. turn right after the church, to leave the square by the Breed straat. Continue through Dubbele Buurt, and go straight on along the square Koemarkt (Cow Market). from the square, go straight on. At the end of this street, there are traffic lights on your left, but you don’t need to cross there. instead cross the road, to the cycle path directly opposite, and continue along Purmer steen weg. (The street-name sign is on the house on the corner). pass the new Town Hall, and immediately turn right, along the cycle path (sign for Station). After 300 m, turn left, and the station is in front of you. The station is small for a city of 80 000. It is served by a Schiphol Airport – Hoorn commuter service, with two trains an hour. go under the railway via the cycle tunnel. Go straight on to the second cycle sign, which is behind a tree, about 100 m after the tunnel. Turn right here, in the direction of Monnickendam. continue along Wetering straat, which turns to the left. This area is called ‘De Gors’, and it was built in the 1980’s. At the time, the dreary housing was seen as an improvement on the slab and tower blocks of the late 1960’s. at the traffic lights cross the main road (Gors laan), and go straight on. After another 200 m, turn right into Bovenlandse straat. here too, the road bends left, and then rises to a wide bridge. You cross here the ring canal of the Purmer polder, another reclaimed lake. go down from the bridge. In front of the first houses, turn right along the cycle path. It also bends left. From the bend, you follow the path, in an almost straight line, out of Purmerend. cross a curved cycle bridge with white railings: on the left here is the local shopping centre. This area, ‘De Purmer Zuid’, has bigger houses, more gardens, more water, and more open space. It is architecturally intermediate between ‘De Gors’ and Weidevenne. pass under the ring road: continue past the last houses. after a small wooden bridge, there is a field in front of you. Turn right here, along a tree-lined road, one of the original axis roads of the polder, with some old farmhouses. after 700 m, turn left: follow the sign for Monnickendam, along a tree-lined cycle path (Groene weg). about 1 km on, cross a bridge with white railings. The canal here is the axial canal of the polder, the main drainage canal. Cycle on into the original open polder landscape. The canal is the municipal boundary of Purmerend, that is why the landscape has been preserved. The Purmer polder has the same shape and structure as the Wijde Wormer – oval polder with axial canal and two longitudinal roads – but it is bigger. There were plans to fill the eastern half of the polder with new housing, but they were abandoned during the crisis. at the next road, turn right, toward Ilpendam. Follow this road for 4 km: it bends several times. Further on, the two church spires of Ilpendam are visible ahead. approaching the village, cross the ring canal (out of the Purmer polder). After the bridge, turn left into Ilpendam. pass the church. At the village hall (Dorpshuis), turn left into Dorps straat, the village street of Ilpendam. at nr. 66, turn right. Pass the village pond, originally a harbour, and continue to the main road. turn left along the cycle path, beside the main road, which is itself parallel to the Noordhollands Kanaal. You now follow this road for 4 km, on segregated cycle path or access road. The road has a fully separated bus lane, the main form of transport between Amsterdam and Purmerend. A metro line was once planned, but that is no longer under consideration. The old tram line on this route closed as uneconomic – and that was in 1949, when cars were a luxury. pass the small village of Watergang – a single narrow street, parallel to the main road. Continue alongside the main road – the dead-end sign is not for cyclists. Watergang has no significant heritage buildings, but because the canal and the highway by-passed it, it is a well-preserved example of a linear polder settlement. about 1 km after Watergang, the road rises, to cross a bridge over a side canal. Go right here, onto the cycle path, and cross the bridge. pass a bus stop, and then make a U-turn, down to that canal. Follow the cycle sign for Amsterdam. at the canal, turn left under the road bridge: again follow the cycle sign for Amsterdam. After 100 m, you are back alongside the Noordhollands Kanaal. pass a new ferry jetty, and continue along the canalside cycle path. The main road is now on your left. If you want, you can cross by the ferry and continue on the opposite bank. The route to the centre is the same: just follow the canal. at the power line, the canal bends right. Turn right at the next corner, at the houseboats – follow the cycle sign for Amsterdam. continue along the canal bank: pass under the Amsterdam ring motorway, and then another road bridge. Pass, on the opposite bank, a small windmill (D’Admiraal, 1792, it ground ingredients for mortar). cycle on toward an old swing bridge across the canal. The road turns briefly away from the canal: turn right and then right, back to the swing bridge. Follow the signs for Centrum. cross the old swing bridge: here the Noordhollands Kanaal cuts through the former sea dike – the raised road. 50 m after the bridge, turn left, to rejoin the canalside path: follow the sign for Centrum. The houses on the opposite bank are part of the dike village of Buiksloot, built on the sea dike. pass under a new footbridge, and then go under two road bridges. pass some small older houses, and then turn left along the cycle path to the ferry. Cross by the ferry to end this route at Centraal Station. This entry was posted in Cycle routes and tagged Amsterdam, cycle route, cycling, Holland, Purmerend. Bookmark the permalink.